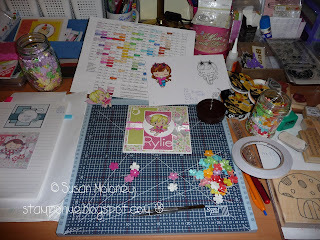 Well it's another Wednesday and it is time to expose my mess creativity to the land of bloggers! As you can see I am in the middle of making a card and am trying to sort out which flowers to glue on. I should add that it is now after 11 o'clock at night and I should be going to bed! I have a pile of Halloween ribbons that I have been using on some cards (will post pics of those tomorrow...the cards not the ribbons!) and haven't yet put them away. Join in the fun and link up your workdesk picture here at the Stamping Ground! Oh so cute stamp on your desk. Looks very tidy compared to me - enjoy the card - looking good! i see you like Copics? too. I just adore them. 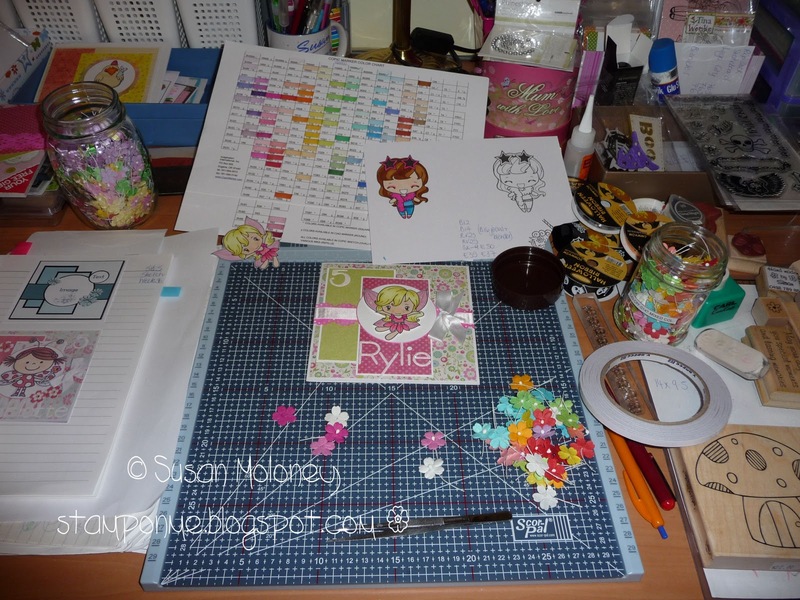 Very cute WIP... and a rather tidy desk, if I may say so!! Great desk, thanks for sharing. After 11pm? Can't see staight by then, let alone colour so well - love the cute card! Also love the big ol' mushroom stamp - have you used it yet? Very pretty desk this week. Love the Toadstool stamp. I'm an "in bed by 10" person otherwise I can't get up in the morning!! Love those two bottles of little flowers, so cute! As is that little card.